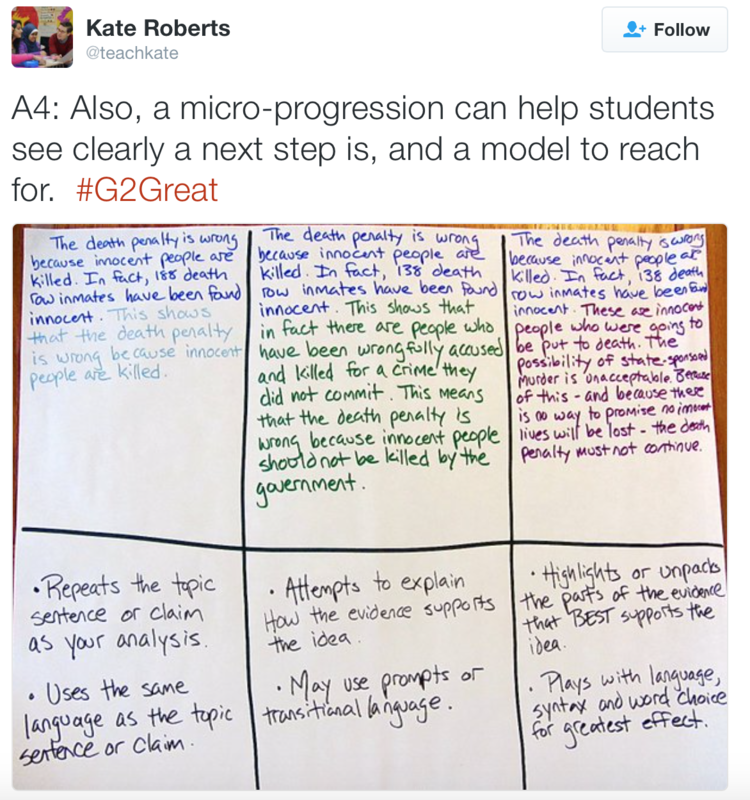 May 19, 2016 was an especially exciting week for me at #G2Great. 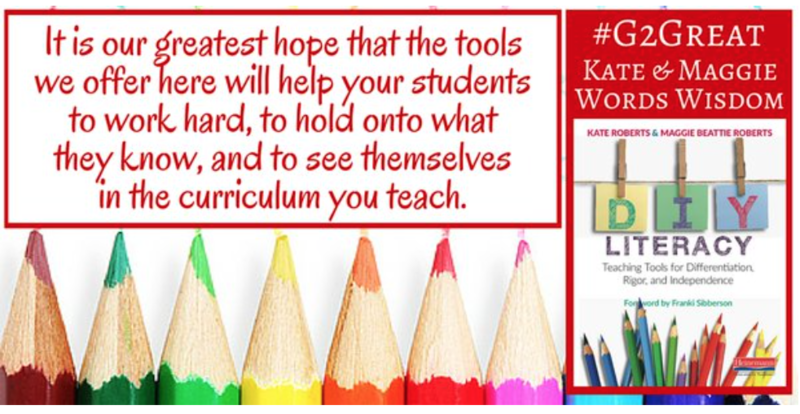 Maggie Beattie Roberts and Kate Roberts were the guest hosts on the #G2Great Twitter chat. Yes, they have a new book, DIY Literacy and yes they are amazing. I was especially excited because I can remember the days that Maggie would come to my office as we prepared for a day of staff development at my former school where I was the literacy coach and she was the TCRWP Staff Developer. The brilliance in Maggie’s methods comes through in this amazing book and I am honored and in awe that I was fortunate to learn from Maggie for many years as I developed as a literacy coach. Often I watched as Maggie took each Sharpie, and carefully chose the color and drafted what to me looked like perfection as she taught us how to create what later developed into DIY Literacy Tools. Teachers followed her lead as she always shared the why behind the work. Teachers felt safe in the struggle and messiness of learning as she led us from meeting to labsites and debriefs. Teachers left with tools they created, practiced in a labsite and then went back to their own classrooms to use these tools with their own students. Learners in any situation fair much better when they understand the why behind what they are learning. 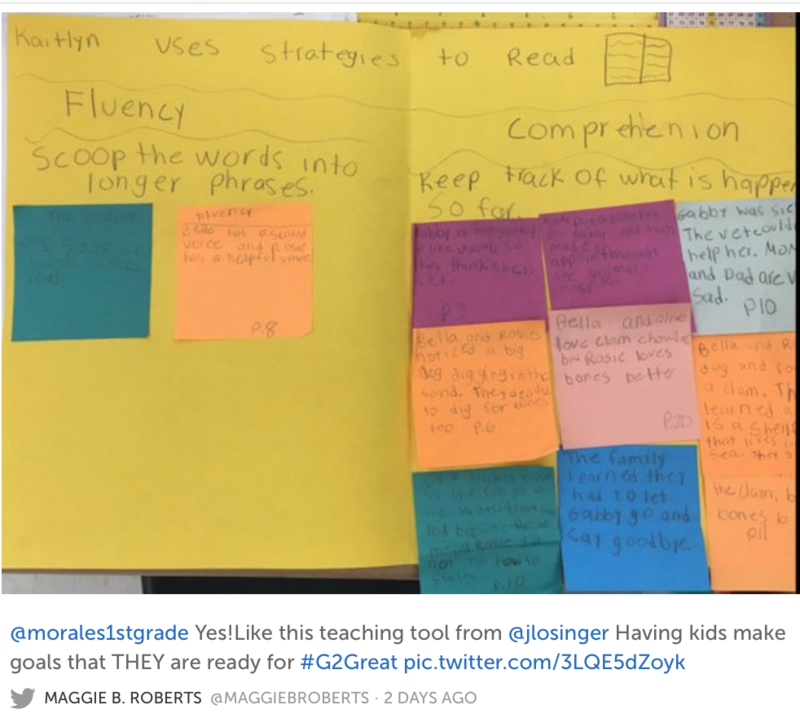 DIY tools such as a bookmark can give students a personal path to strategies that they can reach for easily to do the thinking and reading work that is in their Zone of Proximal Development. Other tools you’ll find in this amazing book are examples of demonstration notebooks. Demonstration notebooks are a powerhouse teaching tool, teachers can use these in small group or conferences. Micro progressions are a DIY tool that creates a learning opportunity where students can find where they are in the learning process and reach for the next available step in learning all while being able to see what is next and why each increment in learning is significant. There is real beauty in the ability to see the progression of learning through these tools as it helps the learner to understand the why behind each increment of learning. Just as the Google Maps app on my phone provides me with a feeling of safety and security when I am on an unknown road and heading to never before seen sights, DIY Literacy tools can help students stay on the correct route while making them feel safe. The stretch that takes place when we learn can be uncomfortable and feel like a struggle, but the tools we help to co-author with students can reduce that struggle, support the stretch and advance the learning. These tools helps to organize the messiness in learning. We should embrace the mess in learning, however if there are tools that can help to organize our learning it makes sense to welcome the mess, bid it goodbye and embrace the tools. During the chat Kate tweeted, “It really is all about the Sharpies.” There is something about those brightly colored markers, once in my hand scribbling on a blank white sheet of paper that helps me to think things through. The thinking that comes from this simple act fosters creativity for me. The process of planning out how a strategy is best demonstrated and learned becomes clear in the context of that learning in action. Working through the process allows for revisions before the teaching and learning happens, making those later opportunities successful. Planning for charts or demonstration notebook pages are perfect opportunities to take out those brightly colored markers. This makes me realize that for teachers and students alike engaging in this process helps students become metacognitive and own the process they are using when thinking. Students co-creating tools like these not only leave them with a tool to refer back to, but take them through the process and the thinking. 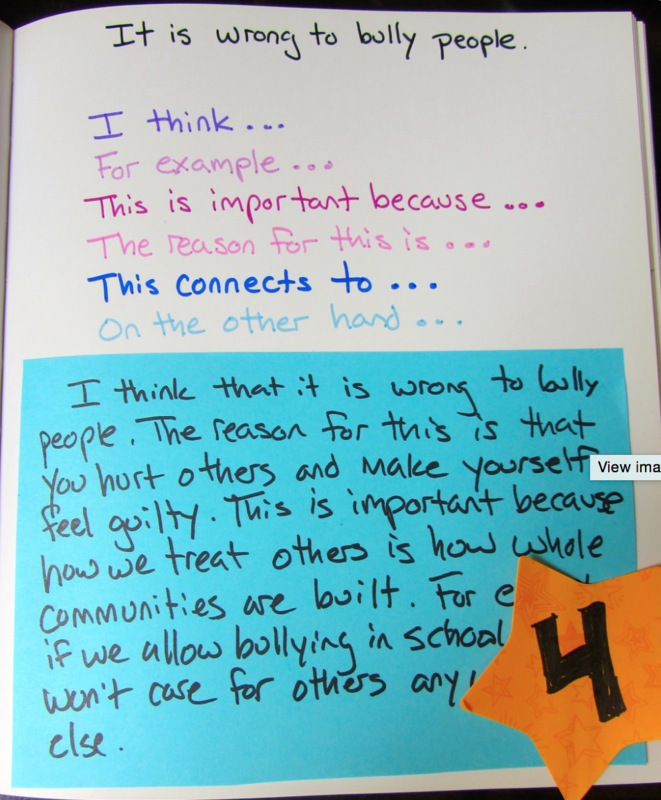 This metacognition around process helps to make learning stick. This is how learners are able to hold onto the process in order to hold onto the learning. Through DIY Literacy, Maggie and Kate support our efforts to identify common problems and explore solutions. The solutions are found in the pages of DIY Literacy… and teachers everywhere are answering their call. 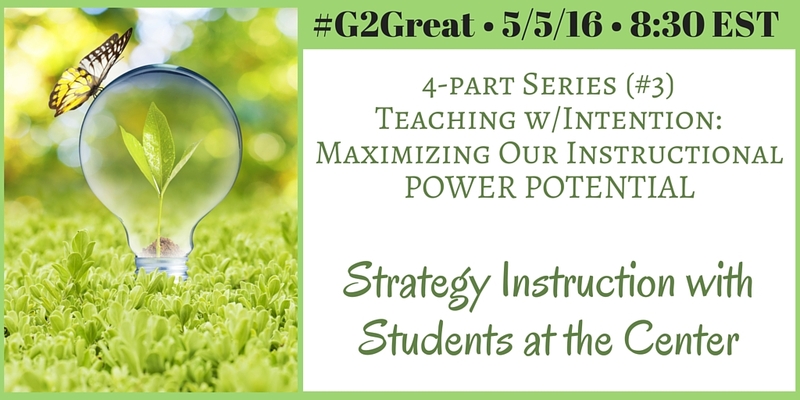 On May 5, 2016, #G2Great continued a four-part series, Teaching with Intention: Maximizing Our Instructional POWER POTENTIAL. This week we put a spotlight on strategy instruction and set out to explore how to approach this work in ways that keep ‘students at the center’ of our efforts. Question 1 set the stage for our exploration: How can we more intentionally frame strategy instruction to increase student engagement in ways that maximize our instructional POWER POTENTIAL? It’s not often that a single tweet to one question can capture the very essence of a chat, but Eric Davis managed to do exactly that with three words that still linger days later. His message is what strategy work with a heart is all about. 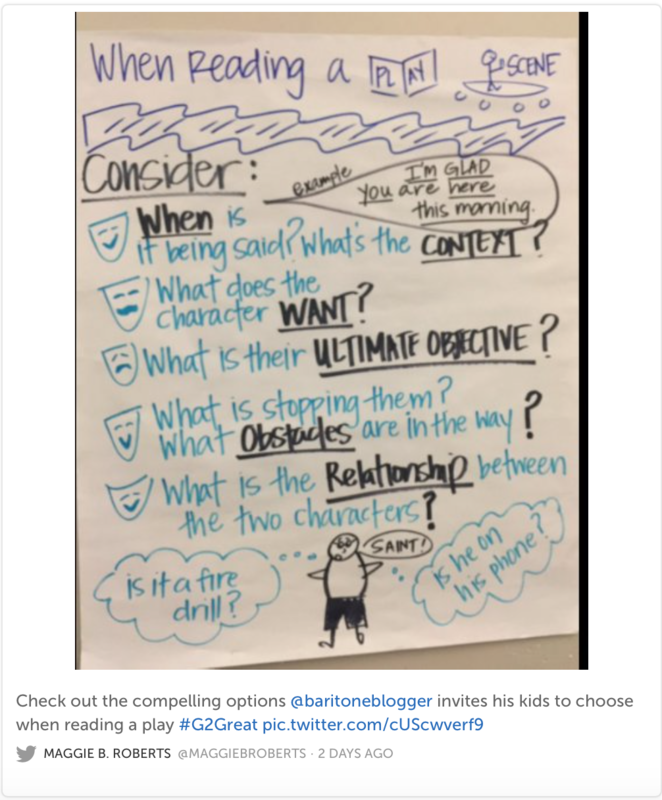 In Teaching Reading in Small Groups, Jennifer Serravallo describes strategies as “deliberate, effortful, intentional and purposeful actions a reader takes to accomplish a specific task or skill” (2010, 11-12). As I viewed this definition in light of Eric’s three words, I was struck by the idea that we will never make our students more deliberate, effortful, intentional, and purposeful if strategies are simply doled out dutifully like a thoughtless ‘to do list.’ Strategy work from the heart is about respecting the students. Respectful strategy work with a heart allows us to approach students with a sense of awe, secure in the belief that each child can and will become a strategic reader. We view students through a success lens, refusing to allow labels and misconceptions to cloud our view of the immense possibilities that reside within each of them. We recognize and honor their strengths and use them as a stepping-stone from where they are to where they could be. We recognize that there is no substitute for books that give them reasons to use strategies. As we teach strategies, we avoid jumping to the ‘rescue’ when they falter to make room for productive struggle as confidence and competence merge. We trust them to take the strategy reigns and then offer just right instructional support while noticing when to fade that support as we step away. Respectful strategy work with a heart reminds us that we cannot do this work unless we know the child in front of us and thoughtfully ponder how to best meet that child’s needs at that moment. We teach strategies based on day-to-day assessment rather than numerical data that leads to strategy groups more akin to instructional cattle calls. We make kidwatching a high priority practice, opting to trust our noticings and wonderings captured on anecdotal references rather than nameless spreadsheets that lose the child in the translation. We rely on strategies that rise from authentic learning with a focus on process over product as we build strategic knowledge and promote independent problem solving in the context of meaningful literacy. We acknowledge that respectful strategy work with a heart only occurs when a book, a reader and a knowledgeable teacher cross paths. Respectful strategy work with a heart draws from this knowledge as it affords us opportunities to select just right strategies at just right moments. We honor what the child brings to the learning table at that point and time and fine-tune our strategy work in ways that will accommodate those needs. We avoid instructional quick fixes and one-size-fits-all strategies as we recognize that we must choose strategies purposefully based on each child. We know that hyper-fidelity to scripts can cloud our view and lead to lock step teaching far removed from child. We steadfastly insist on maintaining control for professional decision-making and make choices based on our knowledge of students and refuse to make any excuses why we can’t. When we are committed to respectful strategy work with a heart we teach within a spirit of Resolute, Responsive, Responsible and Relentless teaching. In short, we are “respecting the students.” Through all of this work, we hold tight to our deep belief that we must celebrate the children in front of us and do all we can to set them down a path to becoming lifelong readers within and beyond the school day. If our goal is respectful strategy work with a heart, pleasure and reading will be companions for every child. After all, isn’t that why we do this wonderful work?